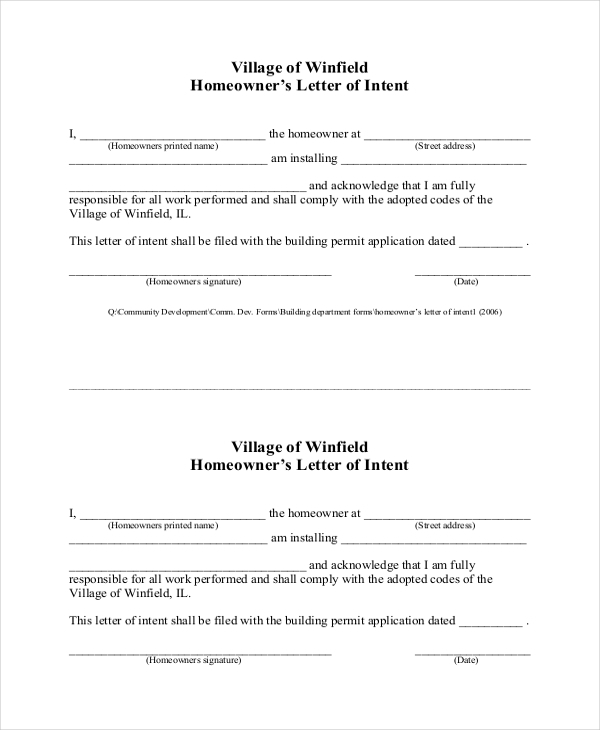 A Letter of Intent is a document which contains highlights about the agreements between two or more parties before the legal agreement is finalized. It is a declaration of the intentions of parties entering into the contract. It is primarily written as an evidence for proposed deals, the entering parties that had agreed upon. A Sample Letters should be used for finalizing business deals. 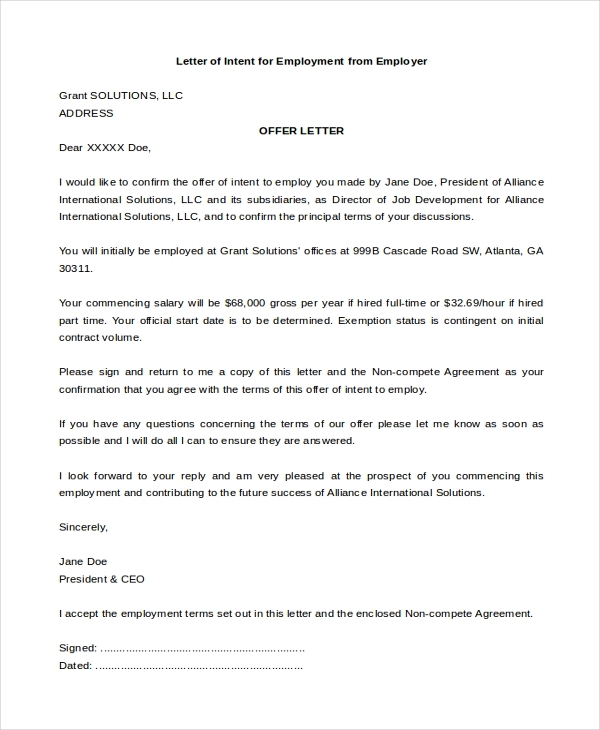 A letter of intent for a job may be used by the job seeker while appearing for the interview. It is a basis of what the employer expects from the candidate. The letter of intent is something that the employer will notice first. A letter of intent for employment has to be sent along with the resume for the purpose of applying for a job. 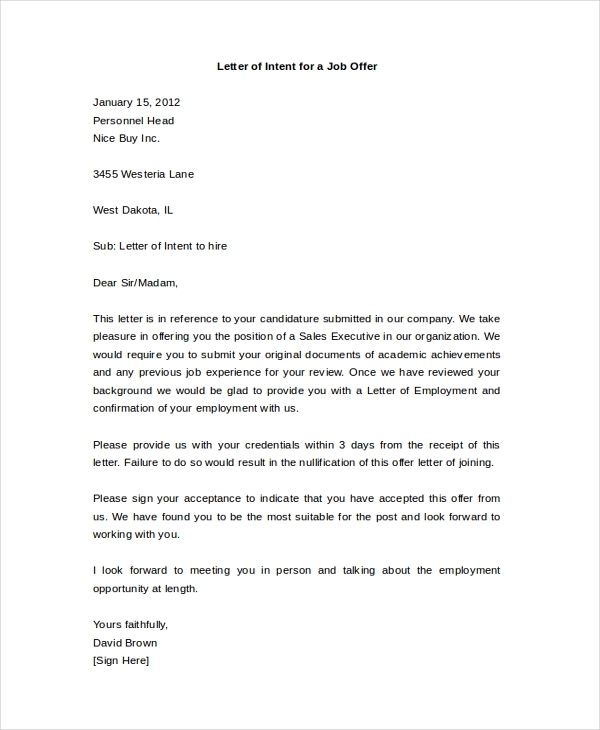 There are several names referred for this type of letter such as cover letter, job application letter etc. You may also see Letter of Recommendation Sample. 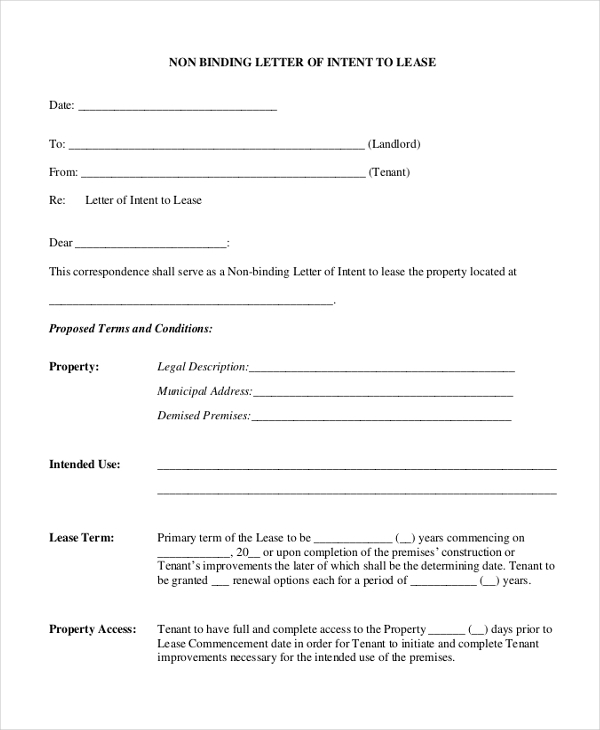 A letter of intent to purchase is given by a buyer to the seller of a real estate property. It acts as a finance securing tool to the buyer. However, it is not a binding agreement which means the seller can choose to sell the property to other buyers as well. 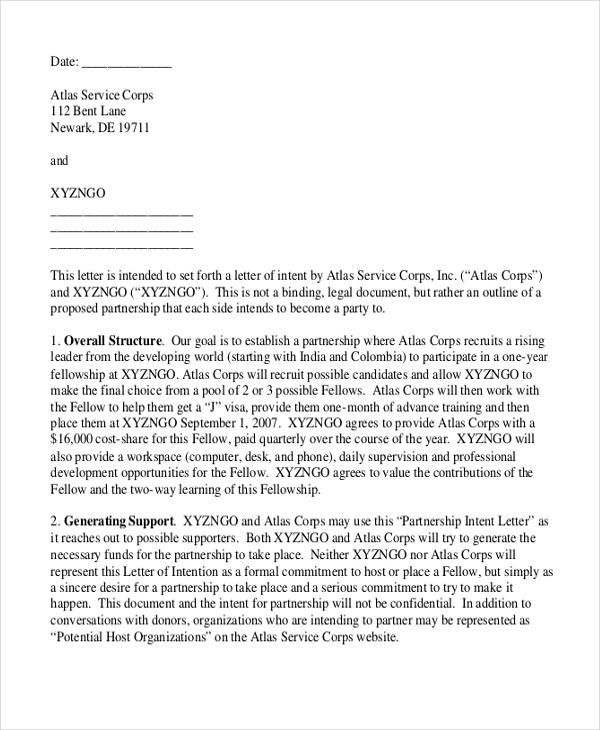 A partnership letter of intent may be given by a party who is interested in entering into a partnership. It is a proposal from the new party who wants to enter into the business relationship. You can also see Character References. 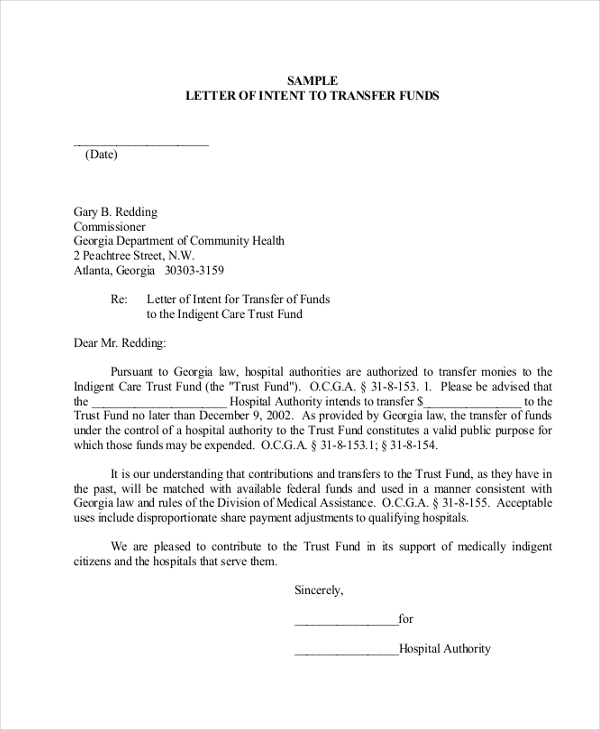 A letter of intent for the transfer of funds is to be written by an individual to the bank requesting for the transfer of the amount from the savings account to the company account for business purposes. 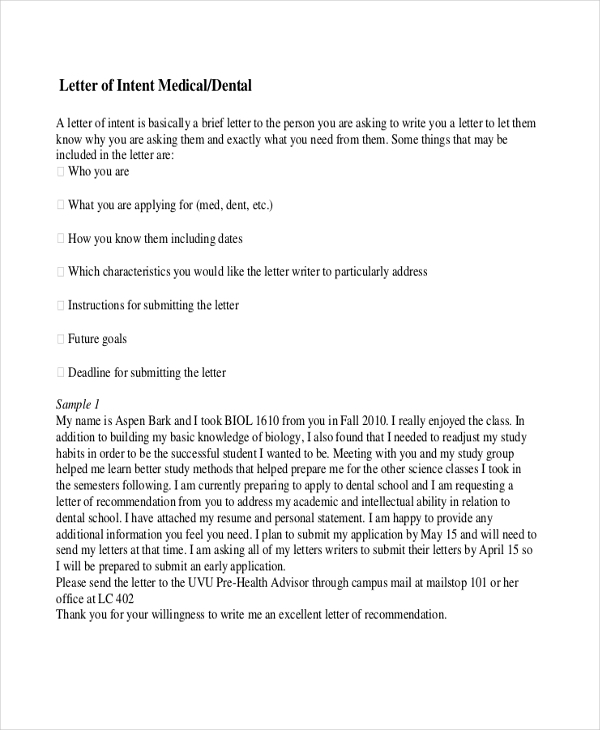 A letter of intent for medical is a letter which is written to express your liking and interest in joining a specific medical school. If you are on the waiting list, then writing a letter of intent can help you get admission. 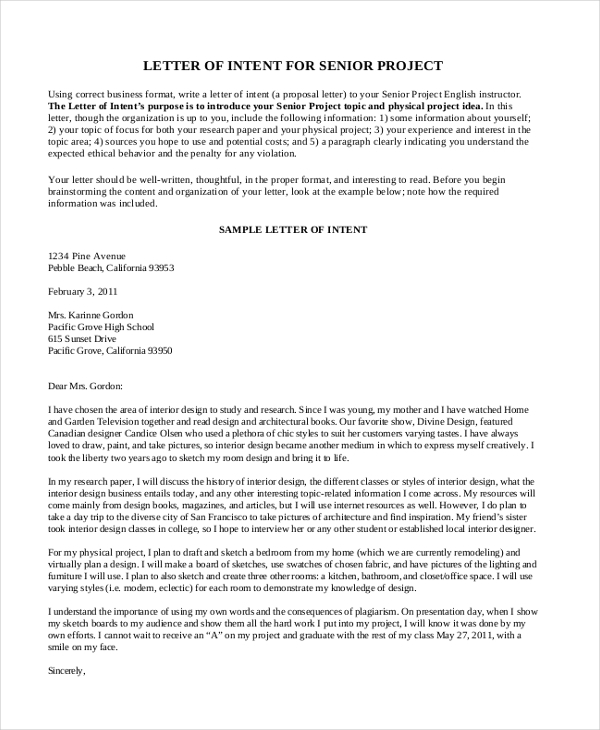 A letter of the intent project may be written for taking up a particular project or for participating in the project. It is also a means for confirmation of participation in any ongoing project. You may also see Formal Letter Formats. A letter of intent is an important requirement that is first given for entering into commercial lease transactions. If the party who wishes to enter into the lease contract with the landlord is serious about it, then he or she may write a letter expressing their interest. A homeowner may write a letter of intent for getting any new installations or modifications done to the house. The letter of intent confirms the homeowner’s approval and wish for the task being done. A letter of intent to destroy may be written by the companies who have defective products. They may write a letter of intent for ensuring that the products will be permanently destroyed, recycled and decommissioned. Why is Letter of Intent Important? A letter of intent is a proof or evidence written by the party or parties involved in a contract. In the case of breach of contract, the letter of intent may be used to claim the rights of a party or parties. The letters of intent are used for negotiating contracts or the terms of the contract. It is an effective piece of paper which contains vital information that is used for contracts and agreements. They may contain terms which are both binding and non-binding the contract. Hence, it is a prerequisite for entering into a contract. You can also see Letter of Application Forms. 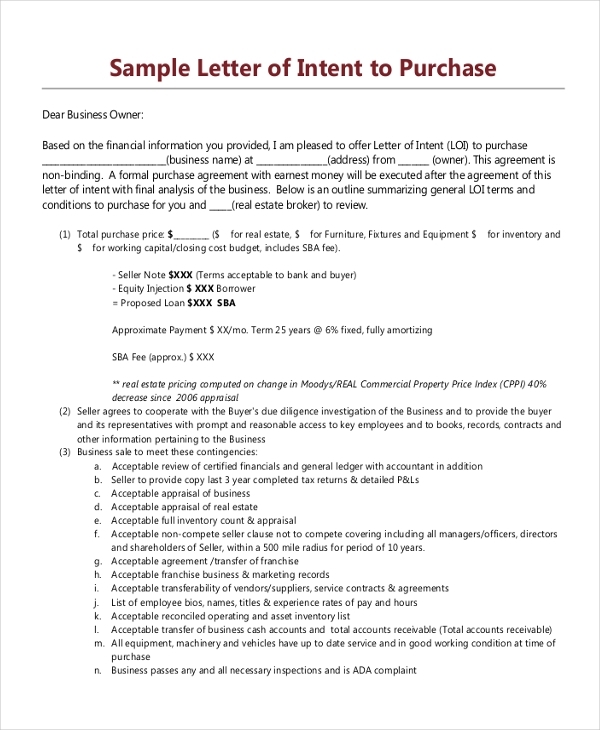 Letter of intent is used by businesses primarily for entering into an agreement. It contains all the terms of the contract. However, the use of letters of intent is not just limited to business persons. It may be used by the landlord for giving his property on rent or lease. It may be written by a student who wants to join a particular university for medical. It may be written by an employee for the application of job to highlight what the employer can expect from him after he or she is employed. It is also written by individuals who want to transfer funds to the bank. You may also see Sample Reference Letters. Letters of intent are primarily used to highlight the details of a specific contract. It may also contain words that express the interest level of individuals who are willing to join into a new relationship or contract. 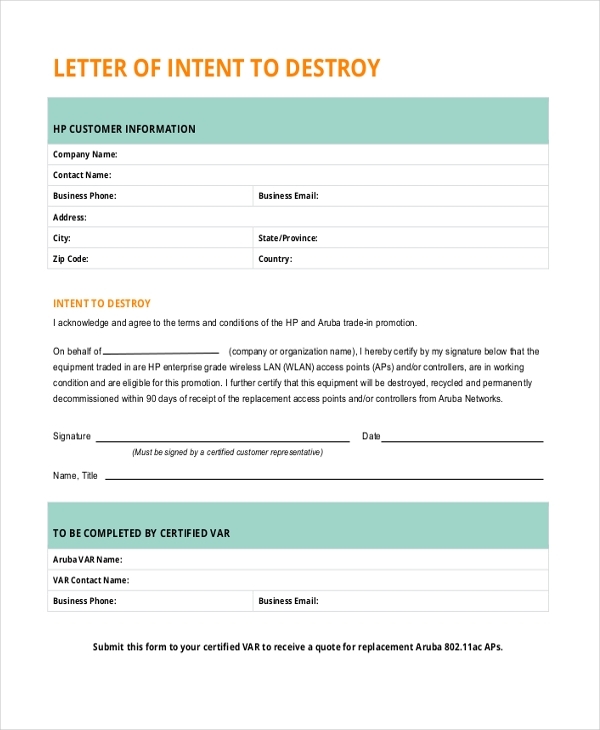 A letter of intent is written by parties entering into a contract to help that act as a shield of protection for claiming rights in the future.